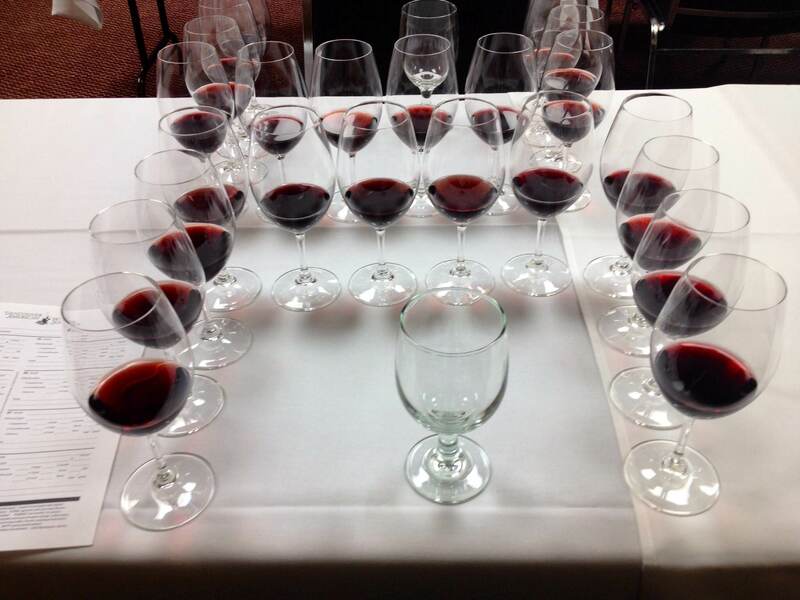 A tasting of a decent breadth of Pinot Noir’s from the United States was held recently by the Vancouver American Wine Society, otherwise known as VAWS (Note: VAWS is in its 35th year and claims to be Canada’s most active wine society. With about 60 people in attendance at this tasting on a Wednesday evening, I’m not about to dispute that claim. Though the central focus is on wines made by our neighbours to the South, VAWS, in appreciation for the talent coming out of our own coveted wine region of BC’s Okanagan Valley, hosted the guest of honour from Howling Bluff Estate Winery, located on the Naramata Bench. For those of you who aren’t familiar with Howling Bluff, those of you like me, I have included a brief description as it was told by Adam Smith, brother of proprietor and winemaker Luke Smith. Today, Howling Bluff has 21 acres under vine, most dedicated to producing Pinot Noir. Current clones planted are 114, 667, 91 and some others that I wasn’t quick enough to record. The vineyard terrain is described as rugged, with a soil composition of clay, and containing very few areas that are prone to frost collection. Howling Bluff is a small family run operation, where Adam says you’ll find the entire family tending to the business on any given day. In quoting his brother Luke, Adam states “we believe the World’s greatest wines come from small wineries that keep their own vineyards.” I have to agree. Moving on to my tasting notes, the following wines were tasted blind with the wines having been already poured prior to entry. We tasted 12 wines throughout the evening however, I will not list all 12 in this review. The following Pinot Noir wines have made it into this review for being well executed, of good value, or bordering on repugnant. Medium ruby in color, the nose is bursting with red cherries and blackberry puree, followed by vanilla, white pepper and clove. This wine is round in the mouth and exhibits cherries rhubarb, black currants and a good balance of tannic and acidic structure that indicates this wine could evolve further. Smooth finish of cherries with the faintness of smoked meat spices. Oak definitely plays a supporting role to the fruit in this wine. I marked this wine as a favorite in my blind tasting notes. Very well done. Would you believe me if I told you this wine came from 4 year old vines? Bogle is a well-recognized Californian brand that is widely available thanks to lots of production. On initial analysis, the nose on this wine I found to be a bit more closed than the others in the line-up. I really had to swirl my glass to get the aromatics going. The nose had a profile of cherries, cranberries, vanilla with an earthy tang. The palate was juicy with cherries, cranberries, loganberry and smoke. Good balance of tannins and acidity. The fruit that makes this wine is sourced from the Russian River Valley, Clarkston, and Monterey. This was the best value Pinot of the night at $19.00, and one that I would not be afraid to serve to dinner guests or to drink on my own. Is this Pinot or Zinfandel? One should never have to ask that question, but I did when it came to tasting this wine. I though perhaps the organizers threw us a curve ball by sneaking in a Zin into the blind Pinot tasting. This wine spent too much time in the sun. It’s overcooked and the flavor profiles are confused. 14.6 alcohol by volume for Pinot Noir is just crazy. So is the price at $65.00 per bottle.